Video does not need to be scary, mysterious or elitist. It can be fun, empowering and inspirational and although there are things you need to understand in order to get the most out of your video production, it is not rocket science. I can get you started. And the truth is, you don’t even need to be able to take a selfie. If you can communicate at least to me what you are about I can help you create video. I have a range of offerings, from a FREE download to bespoke directing packages, from learning online at your own pace to have me available to hold your hand every step of the way. Below are just a few examples (with links) for you to check out. If you enjoy learning online then check out my Easy-Pro Video Online Programme. This video training course takes you step-by-step through the whole production process from coming up with ideas, scripting, style, shooting techniques, editing, YouTube and more. There is also the option to add coaching support from me if you are interested. As a director who avoids shooting video my Business Video programme involves teaching you to how to shoot your own content using your smart phone or tablet, while I do everything else, including input on scripting, presentation and onscreen style. I also edit your videos for you with customised Intro and outro sequences, and help you with building your YouTube channel with content that will elevate you from the crowd. An ancient Chinese Proverb states “The best time to plant a tree was 100 years ago, the second best time to plant a tree is now”. 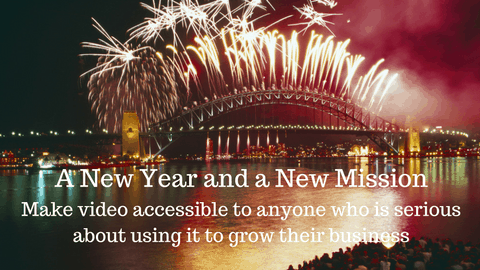 If you haven’t started using video, then make 2017 the Year for Video for you. If none of the above offerings resonate, then get in touch… Book a discovery session below and in 30 mins I’m sure we can come up with something that will work.